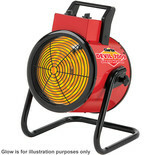 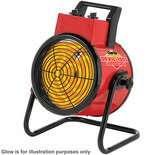 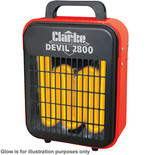 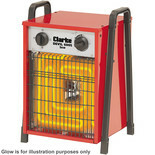 The Devil 2800 heater is ideal for heating your workshop or garage. 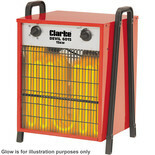 Ceramic heaters are a newer version of the electric fan heater, but the element is ceramic rather than metal. 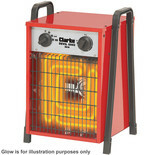 It heats the room by forced convection and is an ideal way to supplement heat in small workshops, garages and kitchens. 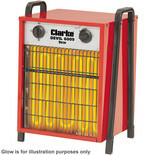 Some ceramic heaters have thermostatic control which lets you set the most comfortable temperature and the element will automatically switch off but the fan continues to circulate the warm air until the temperature drops again. 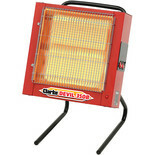 Small versions can provide a little extra warmth where needed, there are also more powerful versions available. 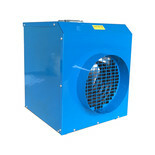 Electric fan heaters are a versatile solution for heating large industrial buildings, but also useful for the home. 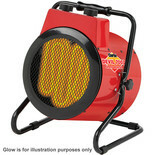 A large range of power levels are available and adjustable versions help you use power more efficiently. 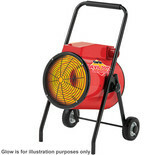 Many models have a built in thermostat to ensure a stable temperature which is comfortable and energy efficient. Using the thermostat, the air reaches desired temperature and the fan continues to circulate the warm air and when the temperature drops the heating element is activated, making the fan heater a great option to heat large industrial spaces efficiently. 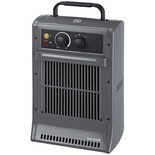 The electric fan heater also has the advantage other uses such as for summer use, when the heat is switched off the fan can still be used, and the automatic ‘frost watch’ feature on some ranges automatically ensures the room stays above freezing temperature.